Rumors about the introduction of Virtual Reality to Nintendo’s unique console hybrid have been rife. To the disappointment of many fans, Nintendo has officially decried these rumors severally, stating that they have no plans for such. The discovery of a hidden VR Test mode on the console did not help matters. Amidst these rumors and confusion, a Canadian company has devised a simple solution to a rather complex problem. 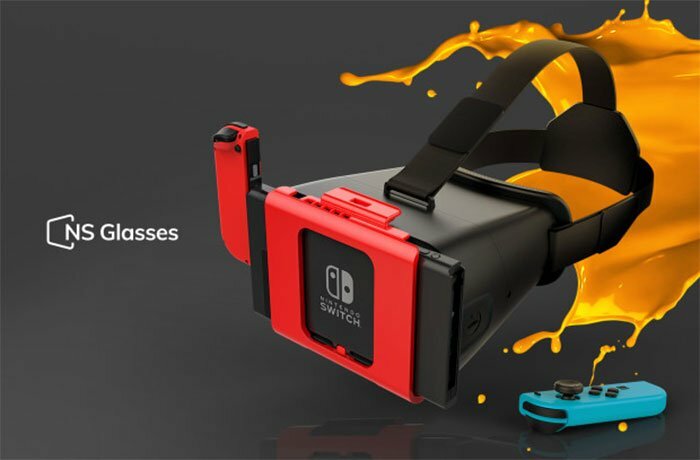 The company developed ‘NS Glasses’ – a simple device that employs color switching technology to convert 2D Nintendo Switch titles into VR. Although it may lack some of the high-end features of virtual reality, the NS Glasses certainly takes your Nintendo experience a notch higher. The NS Glasses looks simple on the eye and you’d be forgiven for thinking it’s a regular mobile VR headset. The design is secure and ergonomic, ensuring your Switch is firmly secured during gameplay. It comes with a tablet that is securely attached to a plastic mount. The plastic mount has numerous gaps to facilitate smooth airflow in the headset. The adjustable head straps and an even more important top strap combine to help the player keep the device in place. The NS Glasses is designed to support all games on the Nintendo console. The makers of NS Glasses promise that it is capable of ‘bringing games to life, offering about 18% perspective 3D experience.’ The pixel smoothing technology that helps soften the rough edges arising due to the 720p resolution of the Nintendo Switch further enhances the gaming experience of users. To further optimize the experience of NS Glasses users, there is an accessible JoyCon Rail-Locks that charges the JoyCons whenever you plug the Switch. The design of the glasses also takes the audio experience of users into account. The vibrant sound from the Switch is fired directly into users’ ears, giving you the optimal gaming experience. What are the other perks of the NS Glasses? No eye tiredness: the reasonable distance between your eyes and the screen ensures you can comfortably enjoy long gaming sessions. No motion sickness: with the NS Glasses, a single lens is all you need to enjoy your Switch. Your eyes would no longer jump around and the possibility of motion sickness is minimized. The NS Glasses is currently at the crowdfunding stage and the Indiegogo fundraiser is already 330% funded. You can visit the page to make your own pledge and enjoy the perks that come with pre-ordering.